Today we have a treat for all you strawberry milk lovers out there. To make the soap, prepare the lye and combine with distilled water and castor, olive, coconut and palm oil. Lye is an important ingredient to soapmaking as it saponifies the oils and water to create soap and glycerin. Click here to read more on what happens. The oils provide moisture to the skin, provides a deep cleansing effect and also is full of antioxidants that leaves you glowing. The fragrance of a soap is really important in the journey of pampering you. 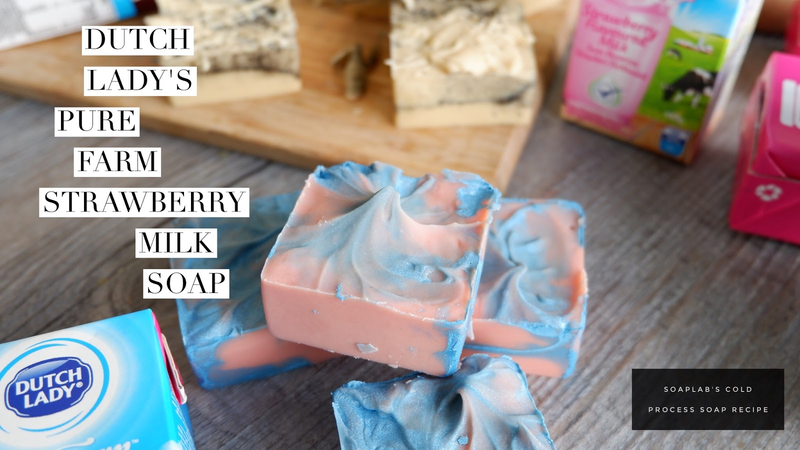 in this we added strawberry kiwi and creamy coconut fragrance oil, which will make you imagine you are in a faraway island, chilling by the beach. For the final touch, add peach pink and neon blue mica with some Dutch Lady’s strawberry milk. Enjoy!